Most problems that PC users experience today don’t require expensive, time-consuming trips to a repair shop, or an in-home visit from a technician. Shops are designed for hardware repairs, and their services are priced accordingly. Problems such as viruses, rogue toolbars, crashes, and poor performance are software related and can be fixed in a few minutes if you have a stable internet connection. You know your computer better than anyone; you know when it flashes strangely, when rogue toolbars appear in the browser, or if it runs slowly. If you ignore or put off getting a problem fixed, it will likely get worse. We understand that you can’t afford to be without your computer for days while it’s at the shop. Now you can get help without worrying about the cost or downtime. Install Heroes can help identify and fix problems at the first warning sign…before further damage occurs. You can watch the repairs as they’re being done and feel secure that no stranger is snooping through your private files. Additionally, you have easy access to a designated help desk technician to make recommendations and answer your questions. Why Heroes On Demand service? Heroes on Demand service completely frees you from keeping track of important tasks and maintenance. 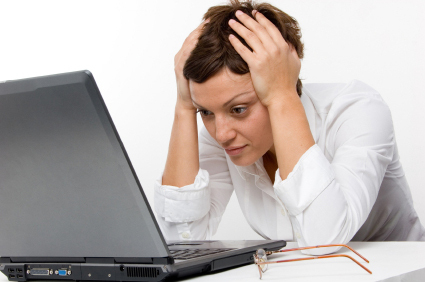 We program your PC to automate these tasks and to let you know if they fail to complete. In the unlikely event that something goes wrong, your technician is there to quickly diagnose and resolve any issues. Your customized plan is based on your PC and your needs and includes daily system maintenance, data backup, regular security enhancements and optimizations, easy help desk access and consultation, troubleshooting and diagnosis, crash repair, virus removal, update management, software and peripheral installation, and tune-ups at any time. Heroes on Demand service guarantees you’ll have assistance when you need it, and since you’ll have access to the same help desk technician every time, you won’t have to repeat a history of issues each time you call. 90% of computer problems can be resolved remotely. Should a problem arise which requires a “hands on” approach, we can send an Install Heroes technician to your location. We understand relationships are important, and we vow to never contract out your in-home service like some other providers. We’ll send the same technician to your home each time on-site service is required. …this service is designed for and focused on YOU; individuals, families and small businesses. You get big corporate style helpdesk care, without the big corporate budget. Heroes On Demand Basic offers just what you need to keep your computer clean, fast, backed up and up-to-date. Our software continually monitors system performance to make sure your computer is running just as fast as the day we set it up. The Basic plan also includes up to one hour per month of remote support for issues such as virus removal, software installation or peripheral troubleshooting. And should we need to send a Hero to your home we’ll give you 10% off all on-site service. 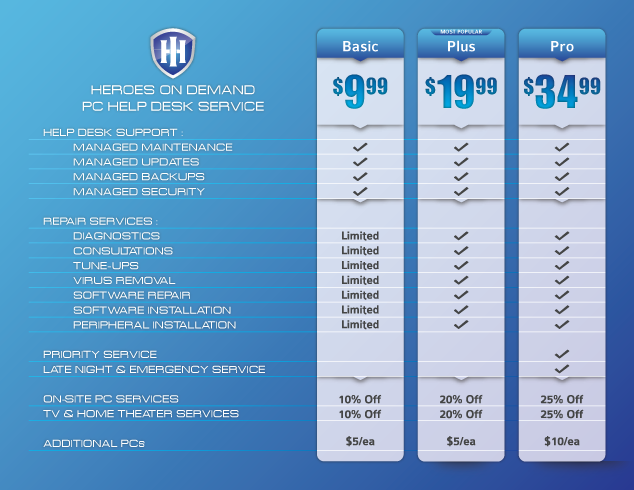 Heroes On Demand Plus takes the Basic plan and ads unlimited remote support for whatever issues arise, and the on-site service discount is extended to 20% off. Heroes On Demand Pro is geared toward the at home professional. Whether you just want the utmost peace of mind or you’re a small business owner who works out of a home office, you can rest easy knowing you’ll get priority service, even late at night and you’ll always get the deepest discount on in-home service. You’re a professional and we treat you like one.